Karrie Laughlin collaborated with Savanah to bring her design concept to life. Laughlin contacted numerous materials suppliers to support the initiative and settled on three very willing and capable companies, including Accurate Perforating & Metal Fabricating, to assist in the build. Accurate worked in conjunction with Karrie Laughlin, Wilsonart, and Panolite to engineer Colestock’s designs. From the collaboration, Accurate and Wilsonart created a 72” long x 30” wide rectangular shaped table designed to display material swatches at a convenient and pleasant height and angle. Accurate developed the table bases from 16ga. 1” carbon steel tubes that were cut, welded, grinded, and then powder coated in soft gold. Wilsonart manufactured the tabletops from Calcutta Marble Solicor from .048” laminated on a ½” MDF board. 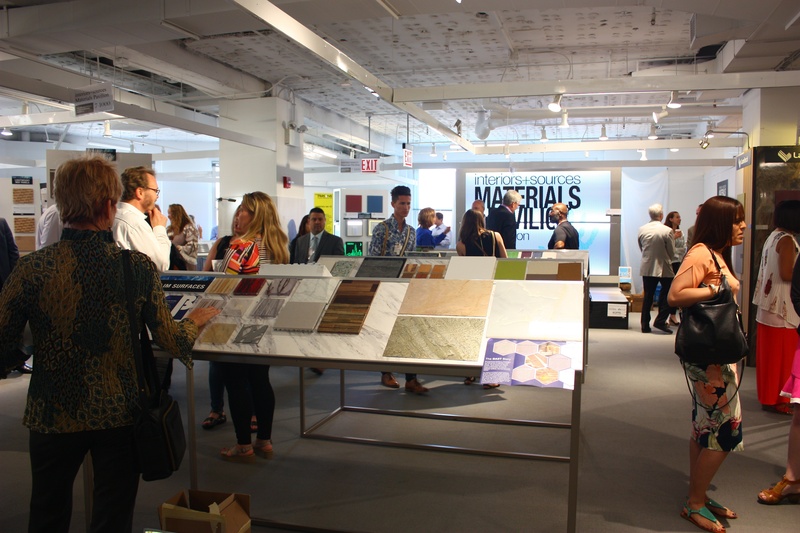 The materials were joined together prior to Neocon 2017 by the Interiors + Sources staff. Accurate and Wilsonart also worked together to create a 36” round wide circular table designed to provide Materials Pavilion attendees a space to converse and recuperate. Accurate created the table bases from 16ga. 1” carbon steel tubes that were cut, welded, grinded, and then powder coated in soft gold. Wilsonart manufactured the tabletops from ½” Brooklyn Concrete 9219GS. Accurate also collaborated with composite panel manufacturer, Panolite, to build the large 72” H x 36” D x 11” W display towers essential in Colestock’s design. Accurate constructed two-layered support bases of 1/8” carbon steel to prop up Panolite’s unique presentation system. Accurate created the tower bases from 1/8” carbon steel plates that were cut, welded, grinded, and then powder coated in soft gold. Panolite manufactured the towers from and unique combination of ½” honeycomb cardboard core with surface board layers. With the commitment from Wilsonart, Panolite, and Accurate Perforating, Colestock vision of a room with “good circulation and to offer a space that is open and airy” was brought to life.